ALIENS are attacking our SHEEP, UFO experts chillingly claimed yesterday. Fuming farmers have been waking up to find animals dead after seemingly being “experimented on”. UFO hunters who set up a special team to investigate are linking the mutilations – including the removal of sheep brains and eyes – to sightings of mysterious reddish orange lights in the sky. After staging a dramatic stake-out they claim to have even WITNESSED unsuspecting sheep being zapped by two of the spheres. Next day he interviewed farmers and “all but one had had some type of unusual disappearance of animals or deaths with strange injuries”. 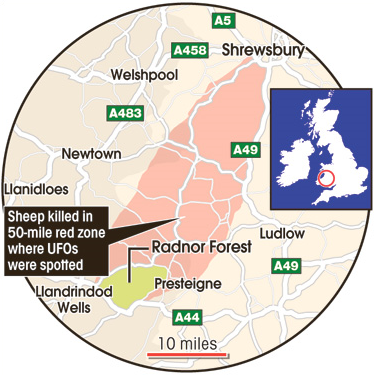 Phil – co-founder of a group calling itself the Animal Pathology Field Unit – is convinced the culprits come from another wool-d.
Phil said the UFOs like to roam a specific 50-mile “corridor” between Shrewsbury and Powys. But Dartmoor and the Forest of Dean in Gloucestershire are other hunting grounds. 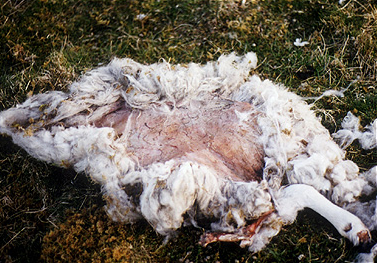 Sheep have been found with neat holes and their brains and other internal organs removed. Others have lost eyes or had their flesh carefully stripped away, usually on the left side. A series of bizarre incidents involving sheep in Shropshire have led to farmers’ claims that aliens are attacking their livestock. Farmers near Shrewsbury claim to have witnessed sheep being “lasered” by unidentified light from UFOs. They have linked the unexplained incidents, where sheep’s brains and eyes were removed, to the mysterious orange lights in the sky. They have found sheep with “neat holes” while their brains and other internal organs were removed. Other animals have lost eyes or had their flesh “carefully stripped away”, usually on the left side. Phil Hoyle, 53, who has spent almost a decade investigating how the livestock have died, said the UFOs were found to have roamed a 50-mile “corridor” between Shrewsbury and Powys. Mr Hoyle and 15 members of the Animal Pathology Field Unit, claimed they witnessed UFOs at work last month while working during the night at a Welsh hill farm near Radnor Forest. “The technology involved in these attacks is frightening,” he told The Sun. “These lights and spheres are clearly not ours. Next day he interviewed farmers and “all but one had some type of unusual disappearance of animals or deaths with strange injuries”, he told the paper. Cattle mutilation (buffalo) recorded by Derek Bridges in Overton – Basingstoka, Hampshire, UK in October / November 2009 around 10:30 pm.